Tell me about the first steps on your journey in psychology. I first became interested in psychology having dropped out of art school around the age of 21. At that time I knew a psychologist who worked in NHS services, and I remember hearing about his therapy approach and thinking that it was a little analytical and cold. I decided I wanted to combine my interests in humanism, Buddhism and philosophy with psychology, with a view to working in the NHS from a more relational, humanistic perspective. Looking back, I realise that my perspective had a lot to do with the arrogance of youth. Having said that, it feels good to reflect that this is exactly what I’ve done 20 years later – I think if my younger self saw me now, he’d be pretty happy about that. That’s a big question! I guess it came during my doctoral studies in counselling psychology at Regent’s University. Learning to become a scientist-practitioner through studying thinkers such as Sartre, Foucault and Heidegger, while being in personal therapy and working in clinical placement, revolutionised my thinking about life. I also learnt a lot about the impact of politics on identity and subjectivity and also about cultural and social conditioning, which I’d been pretty much blind to in my life and my studies until that point. Looking back, I can remember at various stages in my doctoral training feeling for the first time in my life that I’d found a vocation that I not only wanted but had to pursue; a real passion if you like. Coming into the field of counselling psychology through existentialism felt a lot like coming home; I still can’t imagine doing anything else. I also had an incredible tutor at Regent’s in Elena Manafi, whose understanding of and passion for the field inspired me in my studies and my later career. I can still hear her voice in my head while I practise therapy all these years later. Tell me a bit about your current role, and why you’re passionate about it. I’m an independent counselling psychology practitioner and gender specialist. I left the NHS in May, where I’d worked in a gender identity clinic for nearly eight years, culminating in the role of acting lead psychologist. At the moment I offer therapy privately to a broad base of clients, including trans people at various stages in gender transition. I also carry out gender assessments, which can lead to referral of clients for gender-related medical interventions such as hormone therapy or gender-related surgeries. While I’ve always been passionate about working in the NHS, I felt I needed to step out as I was close to ‘burnout’. My role is now much less demanding than in the NHS, as I’m able to offer a great deal more to clients due to being under less institutional pressure. Being able to wield more control and autonomy as a private practitioner is a good opportunity to de-stress for a period, although I’m keen to return to the NHS in the future. I’m incredibly passionate about my field. One of the core reasons I first approached work in NHS gender services was because growing up in rural Scotland in the 1990s, I experienced a lot of stigma and shame around being gay, some of which was gender-related. I remember questioning my gender and being terrified about what that might mean for me in a social environment where gay and trans people were so stigmatised that they were effectively erased. Having moved away and established a life as a gay man in London, I wanted to understand more about gender and the effects of stigma and marginalisation. This also led to my doctoral research on trans people’s experiences of shame and stigma. As I started to work in gender services my passion was truly ignited. My counselling psychology training in epistemological and personal reflexivity, and the learning around the sociopolitical and cultural dimensions of subjectivity that I’d valued so much, were immediately put to use. 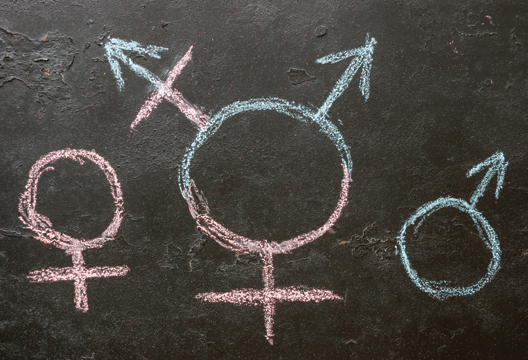 Gender identity services span many different worlds; for example, endocrinology and surgery, speech and language therapy and a diversity of trans communities. My training enabled me to straddle these worlds, hold the tensions between them and communicate across them. For example, I had to become fluent in a variety of different languages (medical, therapeutic and the different languages of the trans communities) in order to be able to work with and advocate for patients whose experience was extremely diverse and didn’t meet accepted social norms. In some cases, due to marginalisation and stigma, my clients’ experience and identities hadn’t yet been understood or articulated, either by them or important others in their lives. Some of these people were also from disadvantaged social backgrounds or from cultures or religions that still heavily stigmatised gender diversity; some also had other mental health issues, both related and unrelated to gender. Understanding and working across these different aspects of clients’ experience, identity and social and cultural context enabled me to do some really effective therapeutic work and to grow as a practitioner. My training also encouraged an awareness of the power dynamics inherent in being a clinician who is also a ‘gatekeeper’ to gender-related medical interventions. It became clear early on in both my work and my research that some of the historical clinical practices in gender clinics had been obstructive and shaming for many trans people. Therefore, it felt really important and valuable to me to be part of a counselling psychology service that, due to the foundational work of Penny Lenihan and Christina Richards, spearheaded a more reflexive, patient-focused clinical approach. I’m still convinced that counselling psychology has something uniquely valuable to offer the field of gender. I also feel that as practitioners we can learn so much by listening to and supporting trans people. Many of them are often under a great deal of pressure due to being positioned not only at the margins of society but also at the front of a great deal of social, cultural and institutional change. Something that has sustained my passion for my field is the impact it has had on my personal development. Working in gender has required me to be highly sensitive to my own position and privilege as a cisgender, white gay man, and to think deeply about what this means in working with both cisgender and gender-diverse people. One of my first big challenges in this was overcoming my own shame in relation to my femininity and sexual identity. More generally, I also learnt to work with clients to neutralise the shaming effects of Western society’s punitive attitude towards gender non-conformity. Most importantly of all, my work has taught me the value of compassion as a therapeutic tool in working against the effects of shame, both for me in my own life and in my work with clients. What are the particular challenges you face at the moment? There are so many challenges in the field of gender at the moment. Increasing numbers of people are struggling to access gender services in the NHS, with waiting lists now ranging between 12 and 24 months from GP referral to a first appointment in a gender clinic. This is partly due to funding issues, partly due to NHS bureaucracy and also the increase in people feeling able to make a gender transition as society’s attitudes have become more trans positive. An issue related to this is how trans people access gender-specific treatments such as hormone therapies and surgeries. As things stand, trans people have to pass through a variety of assessments and need to be diagnosed with gender dysphoria in order to begin medical transition. There are ongoing debates and complex conflicts within the field as to how this could and should be organised in order to better meet trans people’s needs. To give a flavour of them, on one side some feel strongly that gender assessment and clinical gatekeeping is paternalistic and pathologising and that trans people should be able to access care without assessment and diagnosis by specialist clinicians. On the other side, it’s argued that given the irreversible nature of hormone treatment and surgeries, and the fact that UK clinicians endorsing and performing these interventions remain medico-legally responsible for negative clinical outcomes, it’s necessary to maintain rigorous assessment procedures. Another ongoing issue within the field is that with the increasing social and cultural acceptance of trans people, particularly trans women, there has been some backlash, perhaps most surprisingly from second-wave feminists and some other groups in society. While it’s heartening to see the public react against this transphobia, the fact that intelligent and educated people are still recycling transphobic discourse tells us that we are not at a place of full acceptance or equality for trans people yet. I think transphobia will reduce naturally with time as people continue to come out and go through gender transition, making trans people and gender diversity more visible in all areas of society. That said, in order to assist this process, I think that it’s in the gift of gender specialists and counselling psychologists to continue to educate and advocate for the increased acceptance of gender diversity or non-conformity. A lot has changed due to the introduction of legislation that protects trans people in a variety of areas in their lives; however, I believe that psychoeducation is also key, and should continue to take place in many of the institutions where these issues are negotiated, for example, education, medicine, the workplace and the law. I also feel strongly that if there were more understanding regarding the sources and highly toxic impacts of stigmatisation and shame, and how this can interact with gender dysphoria, that people like trans-critical feminists might have pause for thought in how they conceive of and talk about trans people. I would hope that this type of education would lead some of these groups to see that trans women are equally if not arguably more repressed and subjugated by hegemonic masculinity and the patriarchal order. There is more to be gained through feminists’ solidarity with trans sisters than by seeking to shame and oppress them at a vulnerable time in the trans movement towards inclusivity. In terms of access to care, I think that these issues would be resolved to some extent by debate and policy informed by research-based evidence, which is currently lacking. Research could assess the efficiency and efficacy of variety of existing and alternative gender care pathways, and would inform clinical practice, funding and provision of care within both NHS and private gender services. While I appreciate the arguments on all sides, part of me leans strongly towards the idea that trans people should be able to self-determine in terms of access to the treatments they need. I guess I feel that social attitudes towards gender diversity would change to the point where ideally I would be out of a job (as a gender specialist assessor). We need more evidence from empirical research, but I do worry that placing conditions and prohibitions on gender-related treatment can mirror other shaming dynamics in society. Trans people are incited to identify themselves in a way that cisgender people never are, perpetuating pathologisation and feelings of alienation.